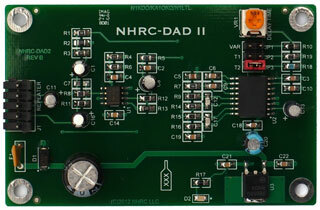 The NHRC-DAD-2 is a digital audio delay for repeater controllers. The NHRC-DAD-2 works with the controller to reduce or eliminate squelch crashes and completely mute DTMF tones. Two fixed delay times compatible with NHRC products. Variable delay time for other applications..
Plugs directly into NHRC-2.1, NHRC-3, NHRC-3+, NHRC-3.1, NHRC-3/M2, NHRC-4, NHRC-4/M2, NHRC-4/MVP, NHRC-5, NHRC-6, NHRC-7, and NHRC-10 repeater controllers to reduce/eliminate squelch tails and completely mute DTMF. Copyright © 2013, NHRC LLC, all rights reserved.